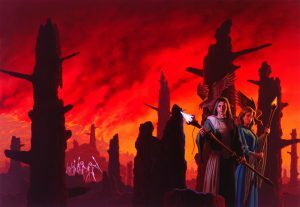 Seven years have passed since Orris, a mage of Tobyn-Ser’s Order, returned from the violent chaos of Bragor-Nal. The threat of attack from Lon-Ser has been eliminated, but the establishment of trade between Tobyn-Ser and its western neighbor has brought new and disturbing changes to the land. Large tracts of woodland have been logged and sold off in exchange for more of Lon-Ser’s “advanced goods.” The Order and the League continue their struggle for supremacy, and a new force, a “People’s Movement,” has allied itself with so-called independent mages who claim no ties to either body. In Lon-Ser, Melyor, the beautiful Gildriite who made herself Bragor-Nal’s Sovereign, is nearly killed in an assassination attempt. Her ally, Shivohn, matriarch of Oerella-Nal, is herself killed by a similar attack. Treachery and betrayal lie at the heart of a plot that endangers not only Lon-Ser, but also Tobyn-Ser and its Mage-Craft. When Jaryd, who has been unbound for months, finally binds to an eagle, he fears the worst, for throughout the history of Tobyn-Ser, the binding of a mage to an eagle has always been a harbinger of war. When Cailin, a League mage, binds to a second eagle, Jaryd fears that his land teeters on the brink of Civil War. Crisis grips both lands. Can Melyor overcome an unseen enemy and a thousand years of prejudice to save Lon-Ser? Can Jaryd and Cailin bring peace to the mages of Tobyn-Ser in time to stop an old and emboldened enemy from destroying everything they hold dear? 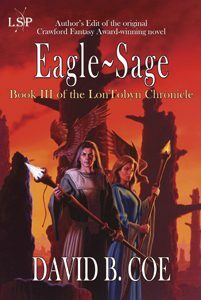 Eagle-Sage is the third and final volume of the LonTobyn Chronicle, David B. Coe’s Crawford Award-winning debut series. This new edition is the Author’s Edit (think “Director’s Cut”) of the original novel. David has polished and updated the prose while keeping the plot, characters, world building, and magic system the same. The result is a novel that will appeal to fans of the original award-winning series as well as those who are coming to the books for the first time. The book can be found here in Kindle Format and trade paperback. It can be purchased here for Nook and in trade paperback.